So the other day, I discovered something amazing. Appearing seemingly out of nowhere in my local Michael’s store I found an ENTIRE AISLE full of laser cut wood shapes and decorations. Gone was the sad little quarter aisle of boring traditional plaques and picked over letter shapes. This was like the mecca of lacey wood frames and fun unpainted shapes and signs and banners. Does your local Michael’s have that now? I think I stood there for about 20 minutes just taking it all in. My very last year of architecture grad school, our school got its own laser cutter and we were the first group of students to learn how to use it. Sometimes I think now how much that probably has changed things for architecture students from then on. A little advance planning and you can build a super precise and beautiful model. Whereas we had no choice but to spend hours cutting everything by hand. The first thing I really made with it was my thesis model which of course was also the last thing because I was graduating. 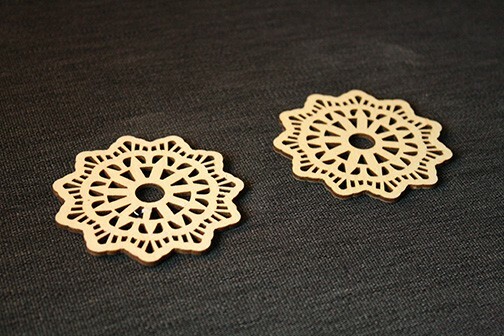 But it was so amazingly cool to watch the laser cut out all the shapes. And that model was so perfect and easy to build that ever since then I have dreamed of all the possibilities of what you could craft if you had access to your own. But I don’t, so this will have to be good enough and this new aisle was definitely exciting for me. (Or maybe I’m just a craft nerd. You decide!) Anyway, I grabbed a bunch of things. 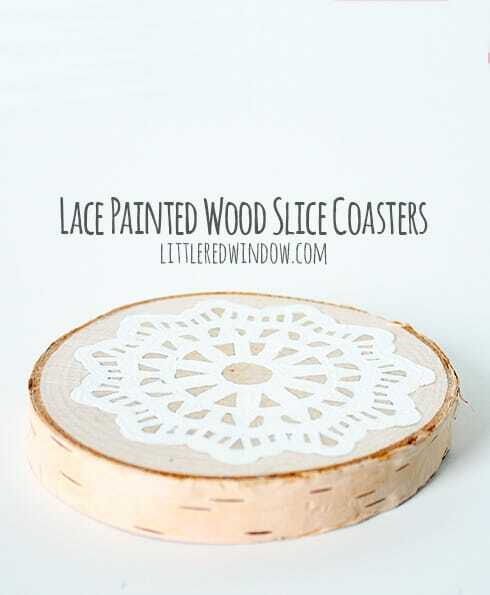 Besides some really pretty 3 inch round lace shapes, I got some to shapes paint, some with other plans in mind and then in another area of the store (NOT nearby the magic laser cut wood shapes aisle which is weird) I found some nice birch bark wood slices. 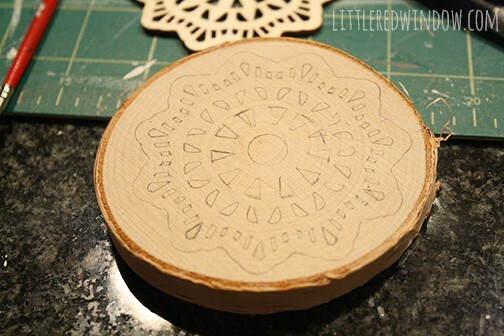 I think wood slices are going to be the “put a bird on it” of 2014. But maybe that’s just me. Anyway, I still like them. 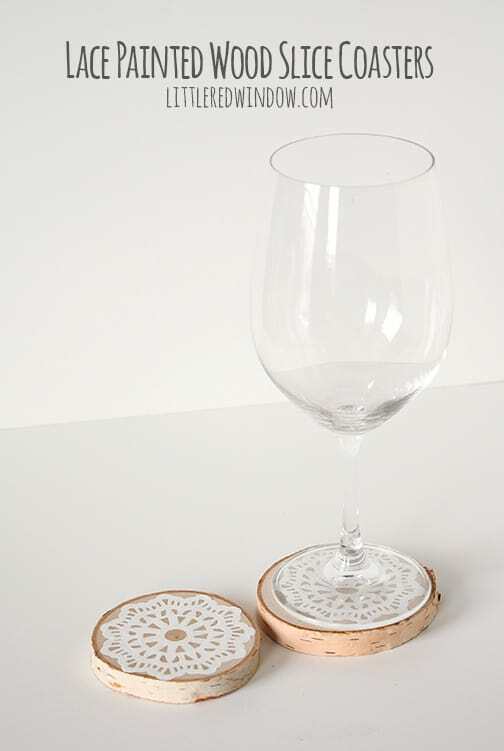 The end result was a set of pretty coasters that I think would make a fabulous gift for a housewarming or birthday! 1. I had plans to actually attach the lace shapes to the wood slices but when I did I felt like it obscured the wood grain too much. So instead I changed my plans and carefully, with a sharp mechanical pencil, I traced the shape on the top of the wood slice. 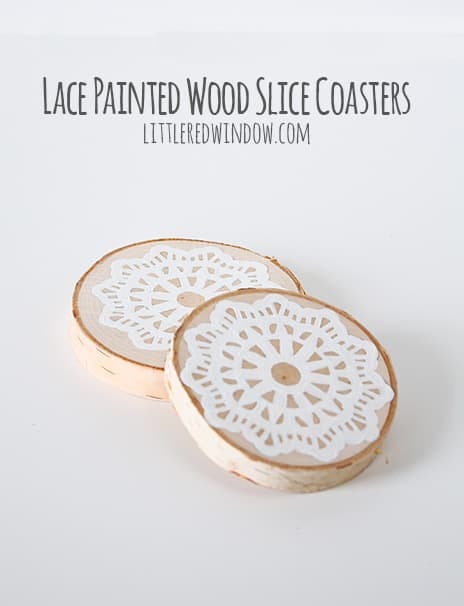 You could certainly use something else other than a laser cut wood shape for the stencil but this worked great and now I still have the lace shape to use for some other project! 2. 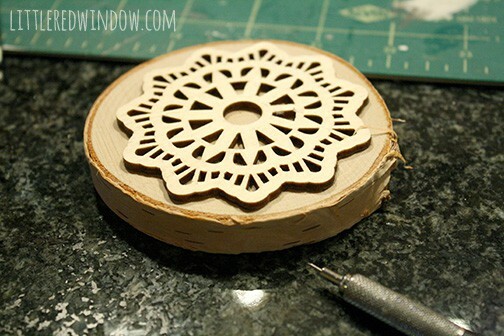 Then using a small brush and lots of patience, I filled in my lace shape with white craft paint. When I was done, any pencil marks that were not painted over erased pretty well with a big eraser. Thanks so much for joining the Say G’day Saturday Linky Party! I have just pinned your wonderful idea. Those coasters are gorgeous! Wow, these are so rustic and pretty and I’ve never seen anything like them before! 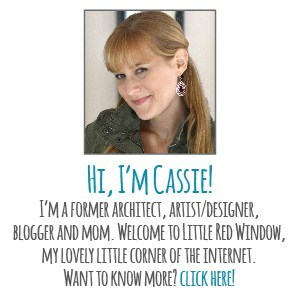 Thanks for sharing at The Makers! They’re so pretty! I miss my Michaels. We don’t have one here, and right before we moved, they’d gotten that aisle of wood shapes and decorations. I kinda stocked up. :) Thank you for sharing at Inspire Me Wednesday. Featuring you in this week’s issue. Beautiful! I can’t get over the intricate detail! I love this idea! It’s such a sweet coaster. Thank you for sharing! These are so pretty – what a great idea! I’m thinking they would make awesome bridal shower or wedding gifts. Ooo, that’s a good idea! They’d be really pretty at a tea party! How sweet!! Love they are so rustic looking! So pretty! And, a great craft project for those of us in small places without a dedicated craft room. I love it!! 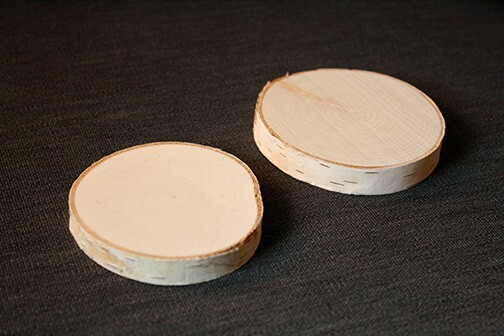 Can’t wait to see what you make with those lacey wood pieces. They are beautiful!